How do I register My Faster PC? I'm getting a Registration Error. Where do I find my registration key? It keeps asking me to upgrade. My registration key doesn't work. How do I update My Faster PC? Where do I find my registration key? My registration key doesn't work. What is your return policy? How do I cancel my subscription? I have a duplicate charge on my credit card. When will my package arrive? What products can be shipped? What is Extended Download Service? I'm experiencing an error or problem. How do I use My Faster PC? How do I register My Faster PC? 1. Go to our Online Store and place an order. 2. Get your Registration Key from the confirmation page or email reciept. 3. Open My Faster PC and go to the Register area. 4. Enter the email address you ordered with. 5. Enter your registration key (copy and paste to avoid typos). I'm getting a Registration Error. I'm getting a "Registration Error: Registration Key"
This means either the email address or the registration key you entered is incorrect. Please double-check that you are entering your email address correctly and using the same address you ordered with. Also, please copy and paste the registration key to avoid typos. Contact customer support for additional help. I'm getting a "Registration Error: No License Found"
This means you correctly entered your email address and registration key but have no available licenses. This can happen if you already registered My Faster PC on another computer or have used all your licenses. Contact customer support for additional help. 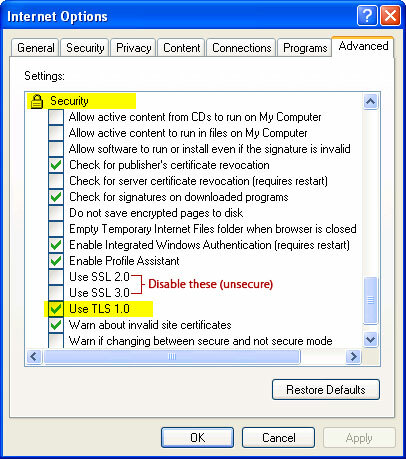 If you are using Windows XP or Internet Explorer 6, this could also mean you do not have a secure SSL methods enabled. To fix this, open Internet Explorer, go to Internet Options > Advanced > scroll down to Security and disable SSL 2, disable SSL 3, and enable TLS. These old versions of SSL are no longer secure and have been replaced by TLS encryption. I'm getting a "Registration Error"
This means My Faster PC is unable to contact our registration server. Please make sure your computer is connected to the internet and temporarily disable any firewalls. Firewalls are often a part of your antivirus software, so check there if you don't know where to find your firewall. Contact customer support for additional help. You should have received your registration key on the confirmation page after your purchase. We also include your registration key in your email receipt. If you cannot find your registration key, you can contact customer support for assistance. It keeps asking me to register. My registration key doesn't work. If you purchased the software and cannot register, please contact customer support for assistance. How do I update My Faster PC? 3. Click "Repair" during installation. You're done! You do not need to register again. If you are updating from version 4, you need a new registration key. You can get a new registration key by following the instructions above. If you are a verion 5 user, your registration key was given to you when you ordered. If you cannot find your registration key, you can contact customer support for assistance. If you purchased the software and cannot register the updated version, please contact customer support for assistance. My Faster PC provides free trial of our software for you to evaluate. We also immediatly register your software once you place an order. Because of this, we maintain a strict no refund policy. You may cancel your subscription at any time by contacting our customer support team at least seven days prior to any anniversary date. Just inform them that you would like to cancel your subscription. I have a duplicate charge on my credit card. We are happy to refund any duplicate purchases. If you have more than one charge from us, email us at Our customer service will email you back within three business days with a confirmation of your refund. Please make sure to include the email address used to make the purchase so our team can locate your order. NOTE: THIS SOFTWARE IS FOR AN INDIVIDUAL CONSUMER LICENSE. ANY UNAUTHORIZED SALES, REPRODUCTION; OR COPYWRITE INFRIDGEMENT WILL BE GOVERNED BY FEDERAL TRADE LAWS. ConsumerSoft RESERVES THE RIGHT NOT TO CREDIT BACK FOR DUPLICATES IF IT BELIEVES THAT ANY OF THESE CONDITIONS HAVE BEEN BREACHED. I'm experiencing an error or problem. Directions for CD use are printed right on the CD sleeve. You should be able to just insert the Backup CD in your system and the installer will open automatically. How do I use My Faster PC? To learn more about how to use My Faster PC and its different features and tools, please refer to our General Help page.